Completed Game: Game Results Posted!!! Discussion in 'Completed Pin Games' started by CanaDaLE, Jan 12, 2018. P.S. For my below list, I figure the alphabets are obvious so just detailing the others. Let me know if more is needed. Shoot! I even knew there was no H as you can see from my note. I could have saved myself taking a pin out of my bag. ;-) Hopefully Tinawap doesn’t deduct for extras! Tamatoa I'd rather be shiny! Sorry, I forgot my user name! *** I don't know if I understood the rule about repeated pins correctly...I first thought you couldn't repeat pins within the two related names. That's when I took my pictures. But now I'm not sure if we weren't allowed to repeat pins at all. But it's too late for me to think clearly anymore! so this is what I got. Goodnight all! Can you believe we're starting week 5? Where has the time gone? Ajk, Kristen W, watzshakinbacon and 2 others like this. 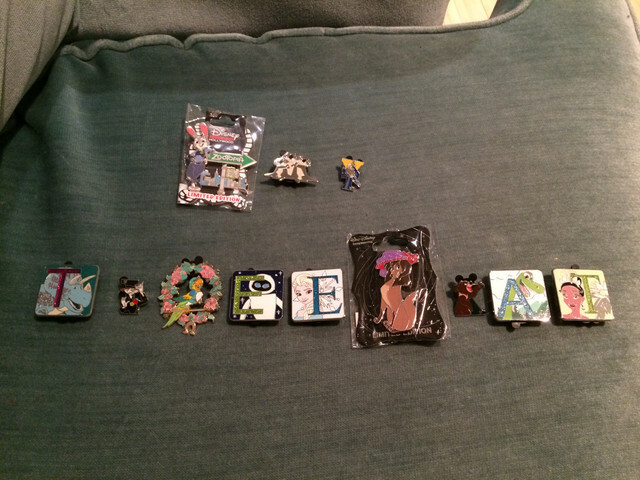 With pins - spell your "Characters name & your DPF name". Must use actual pins. Sorry I was busy all weekend. That Sunday challenge looks like it was fun. If I had any duplicates, they would be all yours. I love seeing the variety of pins people use for these kinds of challenges. 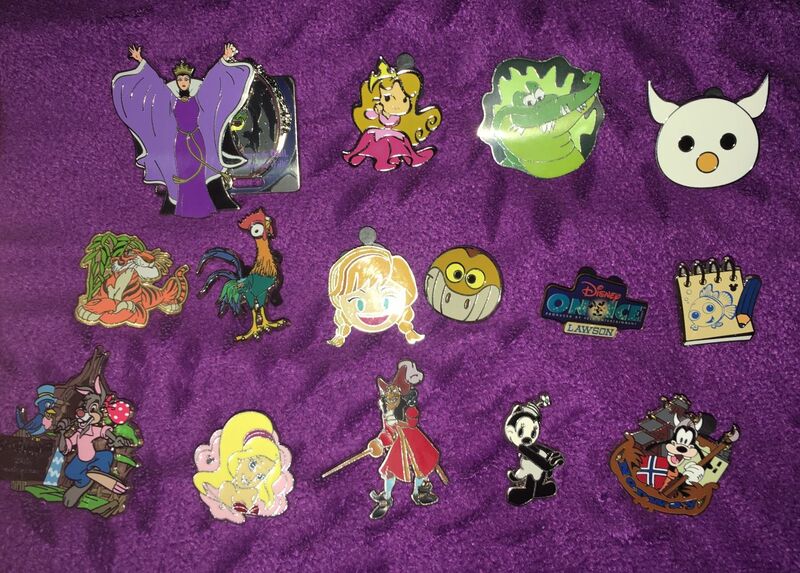 And also, @coblj003 , jealous of that 2001 Grad Nite pin! That was my Grad Night, but at Disneyland, and I don't think there were pins for ours (just a button that TBQH is pretty tacky looking, Ah, early 2000's! ). 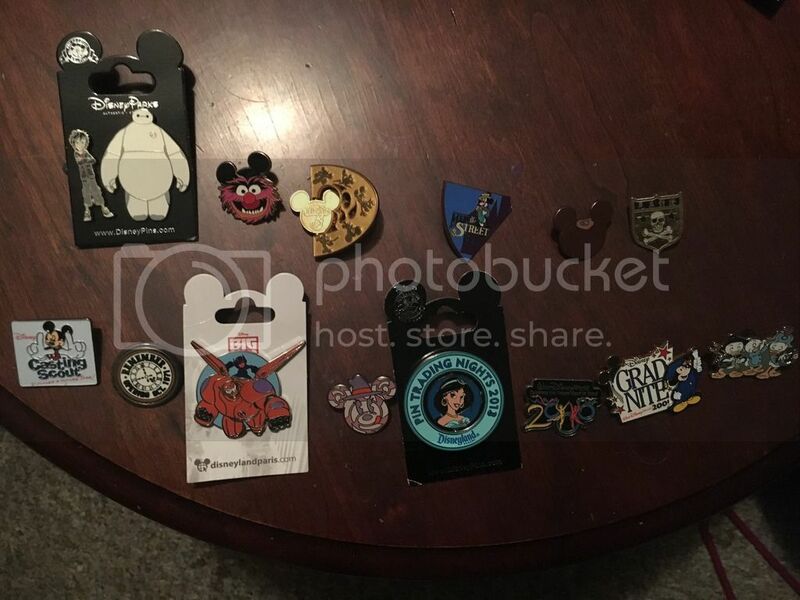 Of course, this was before I got into pin trading, so I wasn't paying attention in the gift shops for pins at all, but I don't recall ever seeing a DLR version of a 2001 Grad Night pin in the past few years of trading. There's a story regarding that pin actually. I did not attend Grad Night at the parks my Senior year(too far). My taste of Grad Night was working Spring 2010 at MK, the best part was seeing the entertainment and fireworks at the castle for four nights. 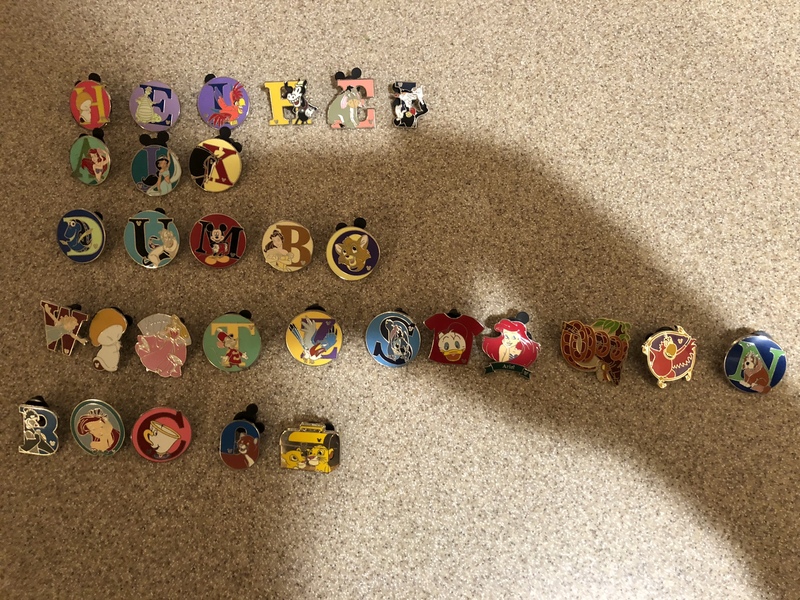 One day at pin replenishment, I saw that pin laying on the top of one of their bins and asked if I could trade for it specifically. It's been my souvineer to remind me of working it, though I've had to invert the year. PS. Do you have any fond memories from Grad Night, my highlights was watching Paramour and seeing the fireworks from the train station balcony(blocked off from the guests). Zap up to 7 fellow game players = 2 points each. This will be on the honor system, if you state you will zap them then I will give you the points. I don't have all addresses, please PM me your address if you haven't done so already. I will PM a list of addresses if you request, there is no time limit to you sending out the zaps, however I do need to know by 7 am Wednesday February 28th how many players you will be zapping. Wed Feb 28 or Thurs Mar 1? I don't have all addresses, please PM me your address if you haven't done so already. I will PM a list of addresses if you request, there is no time limit to you sending out the zaps, however I do need to know by 7 am Wednesday March 1st how many players you will be zapping. Ha Ha, guess I can't read a calendar. Changed post to read February 28th. I will be zapping seven players. I will pm you the specifics tonight.